Lochnagar sits entirely on the royal estate of Balmoral. This fine mountain takes its name from Lochan na Gaire, the deep pool of dark water lurking below the sheer cliffs in the north east coire. The last Sunday of April, a beautifully sunny day, provided the setting for a marvellous ascent via the well trodden route from Spittal of Glenmuick. Dozens of people were out, taking advantage of the conditions, and we ended up having to perch the car precariously on the verge some way down the single track road that leads up from Ballater - the car park was overflowing! The short road walk broke tired legs in after a lengthy drive and, after a brief stop at the ranger and exhibition centre, we set off in earnest. The track forks just beyond the tiny wooden cabin. We took the right hand option, leading across the flat base of the glen to Allt-na-giubhsaich. Here a sign for 'Lochnagar', next to a small granite shed, points the way. A narrow path rises into a peaceful woodland of Scots Pine where a red squirrel was spotted scurrying up one of the gnarled trunks. The path meets a track higher up and this emerges on to open heather moorland at the top of the plantation. The way stays close to a bubbling little burn as it rises over the hillside, fording the watercourse a short way on. The ascent is easy enough and continues for two miles until the high point of the track is reached. A cairn on the left marks the start of a path which drops down to cross the col before climbing. With melting snow underfoot, the ground was soggy but efforts have been made to build the path up and counter years of erosion prompted by the mountain's unfaltering popularity. Large snow sheets were soon encountered as the slope narrowed between Cuidhe Crom on the left and the perfectly rounded peak of Meikle Pap on the right. The path climbs a section of ascent known as The Ladder to a col beneath Meikle Pap and it is here that the impressive crags of Lochnagar - a Mecca for rock climbers - loom into view ahead. Below, the black water of tiny Lochan na Gaire sparkled in the sunshine. The name translates from Gaelic as 'little loch of the noisy summit', perhaps a reference to the eerie swish of the wind as it swirls over the top and down through the crags. Today, however, there wasn't a breath in the air. The route to the summit bears left here, climbing through a hap-hazard jumble of mighty granite boulders to reach the top of a rounded knoll, lying to the north west of the stony summit of Cuidhe Crom. 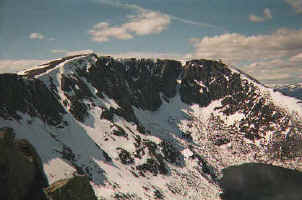 The route descends from here, curving right, round above the cliffs, before rising to a prominent cairn on Cac Carn Mor, the lower of the two Lochnagar tops. Continuing to the higher of the pair, Cac Carn Beag, the path leads round the deep gash of the Black Spout and it's a short walk to the summit (pictured above). There's a trig point perched upon a strange rock formation which looks not unlike the bulging rolls of flesh on the stomach of a particularly obese person. From Cac Carn Beag the views north west to the Cairngorms were simply stunning, an icing of snow sprinkled over the far off mountains. This is also one of the best viewpoints for panoramas over Royal Deeside below. You can return home by the same route. However, to inject some variety into the day, we wandered back over Cac Carn Mor and dropped down to the right of Cuidhe Crom. There's a good path, but on our visit it was lost below a deep carpet of wet snow so we followed in the footsteps of others, down into the deepening cleft occupied by the Glas Allt, enjoying views over the vast upland plain of the White Mounth to the west. As the snow thinned and finally departed, we found the path and let it take us down to a wooden bridge over the burn. From here, it's a short but steep descent to the royal lodge at Glas-allt-Shiel, via a particularly impressive waterfall, made all the more spectacular by the huge influx of snow-melt running off the hillside. The path picks its way down to an apron of woodland surrounding the lodge. 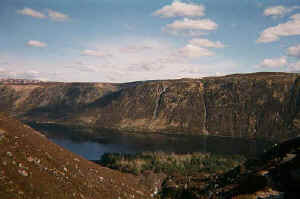 Another bridge crosses the Glas Allt and the path skirts through the trees to join the track looping round Loch Muick. Turn left here, leaving the policies of Glas-allt-Shiel behind, and a two mile trek takes you to a boathouse perched on the northern tip of the loch. A path on the right skirts across the top of the loch, crossing a footbridge over the River Muick before rising to join another track which heads north, back to Spittal of Glenmuick. Start/parking Car park at Spittal of Glenmuick (grid ref 310853). Grading Track and path rising over open hillside to summit of Lochnagar. Straightforward enough in good weather, but great care must be taken in poor visibility when mountain navigation experience is required - there is a considerable drop from the cliffs. In winter, crampons and ice-axes and the knowledge to use them are required to cope with snow and ice.